Cream of coconut and chocolate blend together to make rich and creamy Coconut Fudge. This 2-ingredient fudge is so easy to make and tastes and looks great with a sprinkling of shredded coconut on top. Do you love coconut? I know, coconut is one of those things that you either love or hate. I’m in the love category. I think coconut has a really wonderful flavor I really love it when paired with dark chocolate. I think this fudge is fabulous and was happy to find that most of my family members agreed. 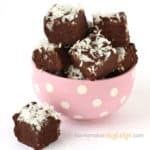 This coconut fudge is so easy to make using just two or three ingredients including semi sweet chocolate, cream of coconut, and optionally, a little sprinkling of coconut. Many of our easy fudge recipes here at How To Make Easy Fudge call for a combination of sweetened condensed milk and chocolate, but there are other thick, sweet, syrups that can be used in place of the canned milk like cream of coconut. Have you ever tried cream of coconut? 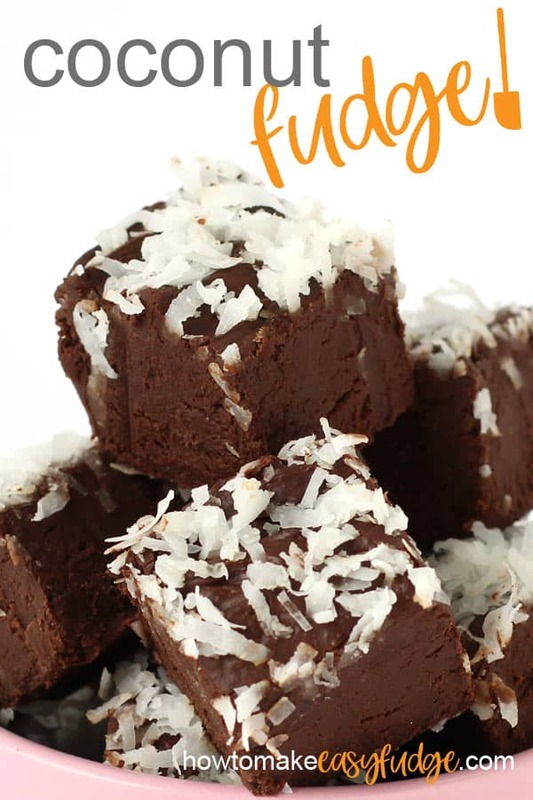 It’s one of the main components in the piña colada drink and it adds an incredible coconut flavor and smooth and creamy texture to this chocolate coconut fudge. Cream of coconut is a cream made from the tender meat of sun ripened coconuts blended with natural cane sugar. It is commonly used in mixed drinks like the Piña Colada. Cream of coconut comes in cans. When you open the can there will be a very thick layer of solidified coconut cream on top and a thin liquid underneath. The label on the can recommends you shake it before opening. Or you can just scrape out the thickened cream into a bowl and pour the liquid over top. Then stir until smooth and creamy. I like to use an immersion blender to get a really smooth cream. A blender or food processor will work too. Where can I buy cream of coconut? You can find cans of Cream of Coconut at a liquor store or in the liquor aisle or the international aisle of your grocery store. I personally use Coco Lopez Cream of Coconut because that’s what’s available in our area, plus it’s product that was used to make the original piña colada. I’m sure other brands will work too. 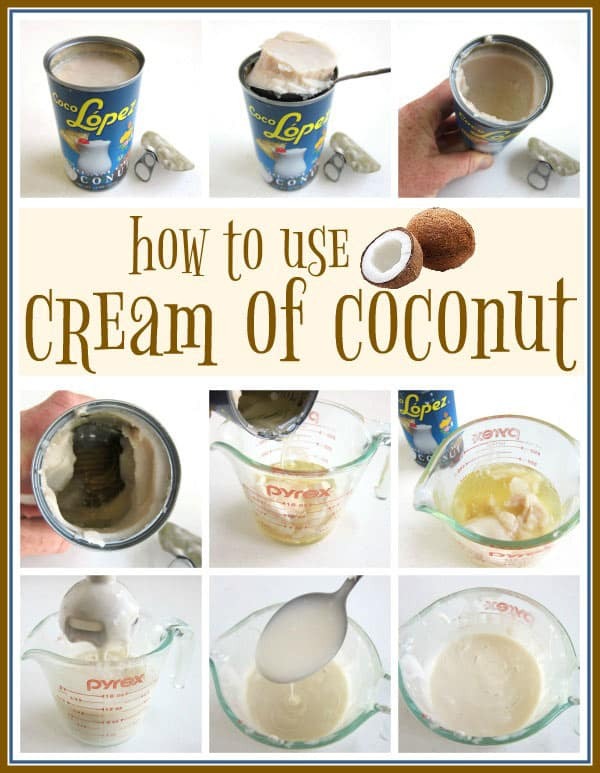 I did try to use a can of organic coconut cream from Trader Joe’s and it is not the same! So be sure to get Cream of Coconut NOT Coconut Cream. 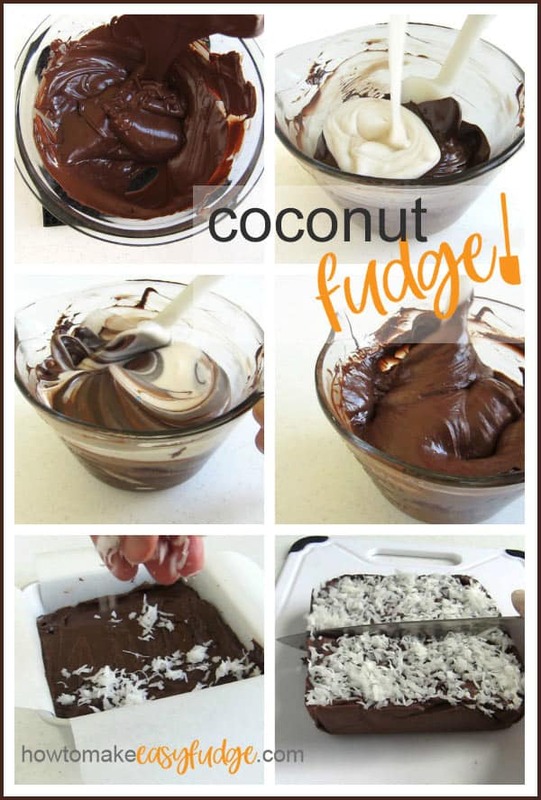 Can I use coconut milk to make this fudge? No! Coconut milk is not thick enough to make this fudge set up properly nor is it sweetened in the same way as cream of coconut. Can I swap out sweetened condensed milk for the cream of coconut to make this coconut chocolate fudge? Yes! 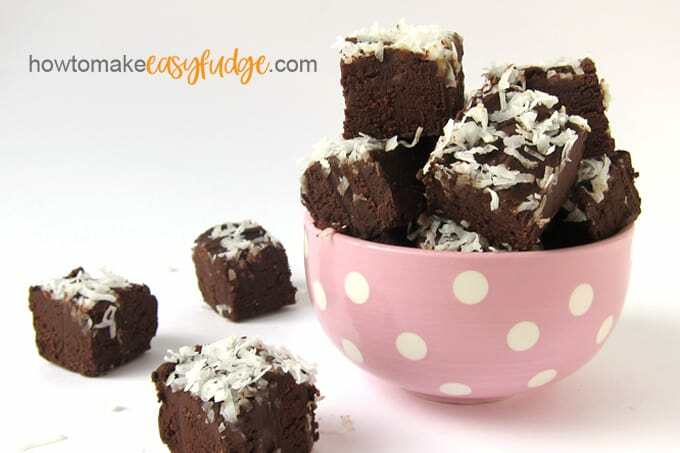 You can basically make our easy 2-ingredient chocolate fudge using one 14-ounce can of sweetened condensed milk in place of the cream of coconut, but you will need to add 1 teaspoon of coconut extract in order to flavor your fudge. If you prefer a lighter flavored fudge you can also start by making our Vanilla Fudge and add a teaspoon of coconut extract to it or use a can of cream of coconut in place of the sweetened condensed milk called for in the recipe. 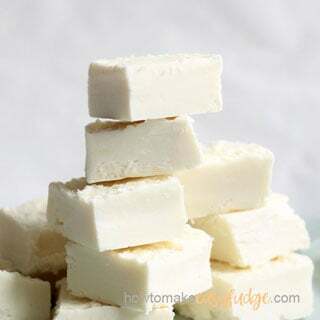 Use 18 ounces of white chocolate to one 15 ounce can of cream of coconut to make that fudge. Can I stir more shredded coconut into my fudge or use toasted coconut instead? If you really enjoy coconut then by all means add some more to this fudge. Toasted coconut can be used in place of fresh shredded coconut. Just note that toasted coconut will add a bit of crunch to the fudge. If you love the flavor of coconut but don’t like the texture, just don’t sprinkle any on top. The fudge will still have a lovely coconut flavor. 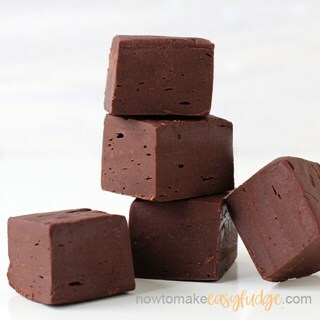 What type of chocolate should I use to make this chocolate coconut fudge? Use semi sweet chocolate with 40% to 65% cocoa content to achieve a really beautifully mellow flavored fudge that is silky smooth. Use bittersweet chocolate with 70% to 90% cocoa content for a much more robust somewhat bitter tasting fudge. Only use unsweetened chocolate (baking chocolate) with 100% cocoa content if you enjoy really bitter, extremely strong tasting chocolate fudge. Create a double boiler by filling a saucepan with 1 inch of water. Heat the water over low heat. Set a bowl over top of the saucepan so that the bowl seals around the edge of the pan but does not touch the water. Pour finely chopped chocolate or chocolate chips into the bowl. Heat, stirring occasionally, until about 3/4 of the chocolate is melted. Remove from the heat and stir until completely melted. Allow to cool for about 5 minutes, stirring every minute or so. You don’t want the chocolate to feel hot to the touch. Let it cool until it feels just slightly warm. Add the cream of coconut and stir until well blended. Spread into a prepared pan (see notes below) then sprinkle with some shredded coconut if you like. Put your chocolate in a microwave safe bowl and heat on high power for 1 minute. If not melted then heat for 15 more seconds and let the bowl sit in the microwave for 3 minutes afterwards. Then stir until melted. The residual heat from the melted chocolate will help melt the pieces of chocolate. If needed, heat for 10 second increments at 50% power, resting, and stirring after each until melted. You don’t want this chocolate to get too hot! Let the chocolate cool slightly for about 5 minutes, stirring every minute or so. Pour the cream of coconut into the chocolate and stir until thickened and well combined. NOTE: If you blend the cream of coconut into the chocolate when it’s too hot your fudge may become greasy. Be sure to allow the chocolate to cool ,stirring it often, until it just feels barely warm. If your fudge does look greasy, pour it into a clean bowl and let it rest for 15 minutes. Then stir until all the grease is worked back into the fudge. If it’s still greasy repeat the process. Once the fudge looks glossy and smooth pour it into your prepared pan. What type of pan should I use to make this coconut fudge? I used a 6-inch square pan to make really thick pieces of fudge. You can also use an 8-inch or even a 9-inch square pan if you prefer much thinner fudge. This would also be a really pretty fudge made in a loaf pan and cut into slices. 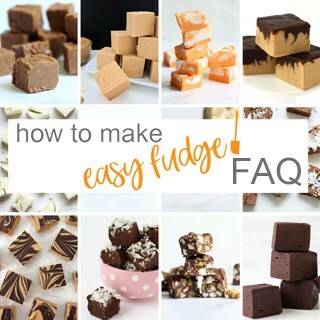 See our How To Make Easy Fudge – Easy Fudge Recipes FAQ for detailed information about how to prepare your pan (lining it with tin foil or parchment paper or greasing it with butter) and how to properly store the fudge for optimized freshness. 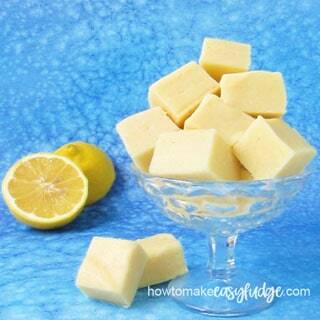 You’ll also find many more tips and tricks for making perfect fudge every time using our easy fudge recipes. You can find the ingredients to make this coconut fudge on amazon (commission earned for sales). Rich and creamy dark chocolate fudge made using cream of coconut has a wonderful flavor. You can serve it plain or top this coconut fudge with a sprinkling of shredded coconut. Line a 6, 8 or 9 inch square pan with tin foil or parchment paper. Melt the chocolate chips using a double boiler or in the microwave. Allow the chocolate to cool, stirring often, until just warm to the touch. Stir the cream of coconut well then pour it over the warm chocolate. Stir until well combined then pour into the prepared pan. Sprinkle on shredded coconut if using. Cover pan and chill in the refrigerator for about 3 hours until firm. Remove and cut into 24 pieces. I can’t believe how easy this coconut fudge was to make. I loved the use of the cream of coconut. It tastes amazing too!!! Thanks! The coconut cream is so wonderful and does make a great tasting coconut fudge. We are glad you liked it.